What a beautiful heartfelt quilt. Thanks so much Julie! I've been looking for that panel for months! 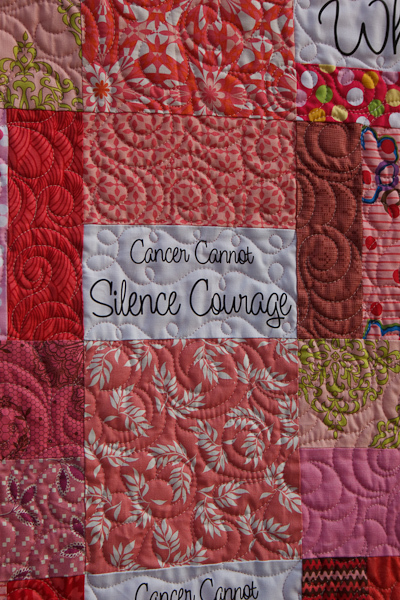 Now I can make a (another) quilt for my 20 yr old niece - she has bone cancer - and the chemo is making her really sick. She has been really good about her treatments until recently - she is starting to loose her sense of humor as the chemo treatments cause so many side effects. Lovely sentiments and oh so true. It's all about the positive energy, thoughts and prayers of family and friends. This quilt is beautiful because of those things too Julie. Warms my heart everytime I see one of these quilts. It also conveys an amazing quanity of compassion, those that have these simply treasure them! As I know Linda & Gail do! That is beautiful, Bless you! 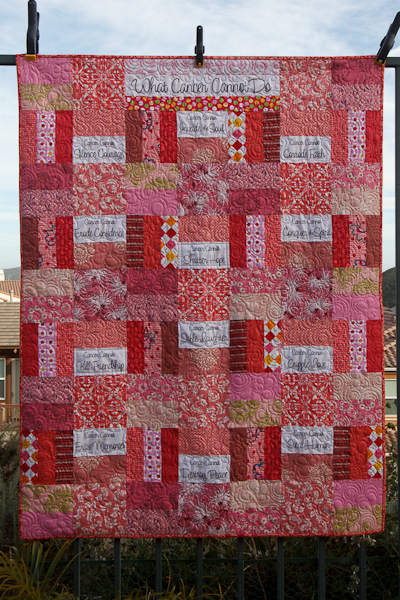 That is a radiantly beautiful quilt, Julie! I love the colors - so joyous! What a nice way to commemorate what someone means to you! 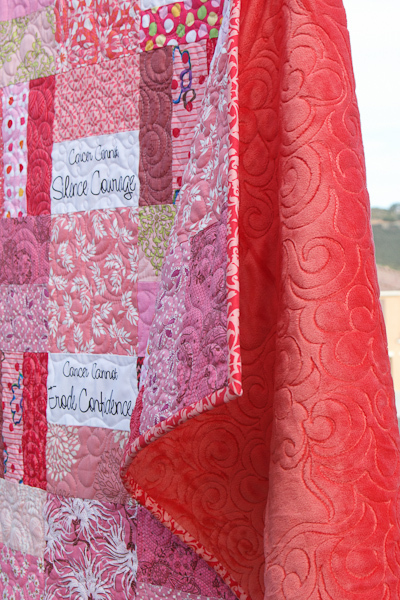 This quilt is as beautiful outside as you are inside and out. You are one very very special person that's for sure. I need to buy that panel - my younger brother has Cancer and he has been fighting it for almost 4 1/2 years. Simply beautiful, and I am sure, each recipient cherished their quilt! I have those labels sitting in my stash. 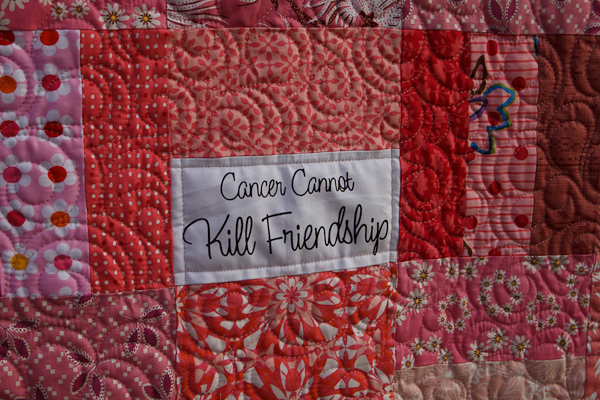 I think I'll sew a purple quilt for our friend Sarah (14) who has battled cancer for over two years now. Julie, I am humbled... and while I want to shed a few tears in awe of your quilt and your friend, I feel a heartfelt warmth of friendship. Thank you for sharing. What a wonderful gift for your friend. Im not just talking about the quilt, its more than that. It is the love and caring you share with her. She is truely blessed to have a friend like you. We should all be so lucky. I know what a difference just one person caring for or having no one you can change your life. What a great idea and such a beautiful quilt. I'm sure your friend will be touched. Wow! This quilt really hits home for me. My grandpa passed away from cancer one month ago tomorrow. Just beautiful! So very true....every word of it. Love the quilt! Julie i would just like to say i agree with every single comment on here. Thank you so mcuh for sharing where to get the panel, I think Cancer touches the lives of every single one of us, maybe not personally, but our Family and Friends. And OMG, I have such a lump in my throat after reading Barb. May God Bless you!!!! Barb, I want to offer my sholder as well, please use it. Julie, I love what you do and where your brain and mind go. My sister died of cancer and she refused to be anything but positive right to the end. 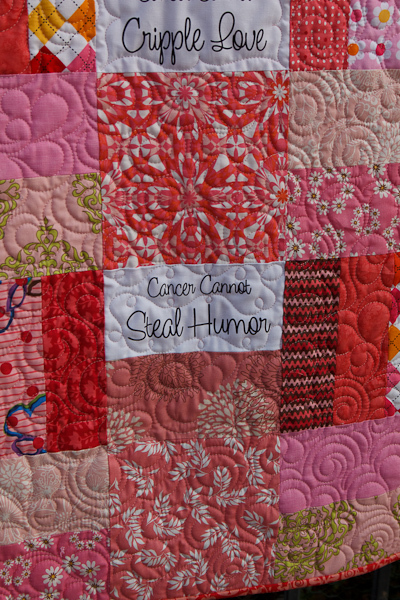 This quilt is so how she felt about not letting cancer get her down. I love it, Julie. You seem to be such a warm and thoughtful person. Barb, I have two shoulders any time you need them. If I live where you live I would be more than glad to take you to chemo and sit with you after. Not sure how to get in touch with you. Love the quilt. I have a necklace pendant with that saying. I have also lost many friends from cancer & my niece was diagnosed with leukemia in 2008. I think quilts really lift their spirits. I love this Julie. I feel like cancer has been circling stealthily to friends and people I cared about and then my Dad was diagnosed this year. Grrr. I think I need to order that panel too. Go away Cancer! Beautiful quilt! Love wordings in the block and that Minky cuddle back is YUM! Great inspiration and encouragement Julie. Beautiful quilt. Barb, as a follower of Julie's work, I think what she has done, is doing and I'm sure will continue to do is so heartwarming. I am on the other side of the world in Aust, but four years ago now I was diagnosed with TWO primary head and neck cancers. My children are grown up, my parents are ageing rapidly, but I can't imagine not having the will to beat the beast. That's why I love my quilting, I might not have enough time to finish everything that's in my head! I am hoping to be cancer free in another three years, I am such a sticky beak I don't want to miss out on anything life has in it. Please, have a change of heart and try some treatment, there is so much to be here for.